What are common causes of balance problems after traumatic brain injury? How quickly can your balance improve? People with traumatic brain injury (TBI) commonly report problems with balance. Between 30% and 65% of people with TBI suffer from dizziness and disequilibrium (lack of balance while sitting or standing) at some point in their recovery. Dizziness includes symptoms such as lightheadedness, vertigo (the sensation that you or your surroundings are moving), and imbalance. How serious your brain injury is. Where in your brain you were injured. Other injuries you had along with your brain injury. For example, in a motor vehicle crash, you could suffer a TBI, cervical spine injury, and rib and leg fractures. All of these injuries will affect your ability to maintain your balance. Some medications used to manage the medical issues connected with the traumatic event or accident. Balance is the ability to keep your body centered over your feet. The ability to maintain your balance is determined by many factors, including your physical strength and coordination, your senses, and your cognitive (thinking) ability. Most people can control their body movement within certain limits before losing their balance and needing to adjust their posture or take a step to keep from falling. Adjusting your posture or taking a step to maintain your balance before, during, and after movement is a complex process that is often affected after brain injury. When you have poor balance you have a high risk of falling and having another brain injury or broken bone. Maintaining balance while sitting and standing is important for all of our daily activities, including self care and walking. Poor balance can keep you from taking part in many types of activities, such as sports, driving, and work. Many different kinds of health care providers may be involved in diagnosing and treating balance problems, including physiatrists (physical medicine or rehabilitation doctor), neurologists, otolaryngologists (ENT), and neuro-ophthalmologists. The first place to start is by having your physician review your medications, since this is a common cause of balance problems. Physical and occupational therapists may also help identify and treat balance problems. Two commonly used tests for identifying balance problems are the Berg Balance Scale and the Dynamic Gait Index. Both of these tests can be used to track your progress as your balance improves with therapy and to provide information about potential risk of falls. Medications: A number of commonly used medications can cause dizziness, lightheadedness and decreased balance. These include some blood pressure medications, antibiotics, tranquilizers, heart medications, and anti-seizure medications. Ask your doctor if any of the medications you are taking may be causing dizziness or balance problems. A change in medications or dosages may improve the problem. A drop in blood pressure when standing or sitting up suddenly (called postural hypotension) can make you feel lightheaded and dizzy. It may occur when you get up quickly from sitting on the toilet or a chair, or getting out of bed. Having your blood pressure taken while in a lying, sitting and standing position may also help diagnose blood pressure-related balance problems. Problems with eyesight (vision impairments): Eyesight is one of the key senses you need to keep your balance. Eyesight problems such as double vision, visual instability, partial loss of vision, and problems with depth perception can make your balance worse. Benign paroxysmal positional vertigo (BPPV) is one of the most common causes of vertigo. With trauma, the crystals in the inner ear can be moved out of place, making you sensitive to changes in gravity. BPPV is characterized by brief episodes of mild to intense vertigo. Symptoms are triggered by specific changes in head position, such as tipping your head up or down, and by lying down, turning over or sitting up in bed. You may also feel out of balance when standing or walking. Labyrinthine concussion or injury to the nerve to the vestibular system are also causes of vertigo and imbalance after brain injury. Traumatic endolymphatic hydrops occurs when there is a disruption of the fluid balance within the inner ear. When this happens, you may have periods of vertigo, imbalance and ringing in your ears that last for hours to days. Problems with your ability to sense things (sensory impairments): For example, nerves in your feet send messages to your brain that help you keep your balance. If these nerves are damaged from your brain injury, your brain may not get the messages it needs. The brain may need to rely more on your eyesight and inner ear to keep your balance. Brainstem injury: A traumatic injury to the brainstem and cerebellum (parts of the brain that control movement) can make it hard for you to walk and maintain your balance. Leakage of inner ear fluid into the middle ear (called perilymph fistula) sometimes occurs after head injury. It can cause dizziness, nausea, and unsteadiness when walking or standing. It can get worse when you are more active and may get better with rest. Mental health issues: Sometimes people with brain injuries have anxiety, depression or a fear of falling. These conditions can cause or increase balance problems. Doctors call this psychogenic dizziness. Balance problems can have many different causes, each one requiring a different treatment. Your doctor, physical and occupational therapists and/or other health care providers will work with you to understand and treat all the different causes. Increasing your strength and flexibility will help your balance. Specific exercises include stretches for your ankle and hip muscles or strengthening activities for your legs, such as mini-squats, toe- raisers, or standing leg lifts. Go to www.nia.nih.gov/Go4Life for more information about these exercises, or talk to your doctor or physical therapist. Find your limits in balance by moving your body over your feet as far as you can without lifting your feet. This will help you develop balance strategies to prevent losing your balance. You can also practice movements that allow you to transition from one position to another, such as going from sitting to standing, reaching above your head to get something off a shelf, or picking up something off the ground. Practice standing or walking in different conditions. For example, you can practice standing with your eyes closed to decrease your dependency on vision for balance or stand on a pillow to improve your ability to use vision for balance. Change how far apart your feet are and work on balance by bringing them closer together, in front of one another or even stand on one leg. Practice activities that will improve your balance while walking, such as walking longer distances; walking and keeping up with someone else while carrying on a conversation; walking over different surfaces, such as on grass and sidewalks; and walking in crowded places such as the grocery store. Be cautious when working on your balance, and make sure you work at an appropriate level to avoid falling when no one is around. A physical or occupational therapist can help design a program that is safe for you to practice at home. BPPV is treated by using movements to relocate the crystals in your inner ear back to where they belong. To learn more about the treatment of BPPV, go to http://www.tchain.com/otoneurology/disorders/bppv/bppv.html. How quickly your balance problems improve depends on the extent of injury and your health status before your injury. A condition such as BPPV can be treated effectively in one or two treatment sessions. Injuries that involve many types of impairments can take weeks, months or years. 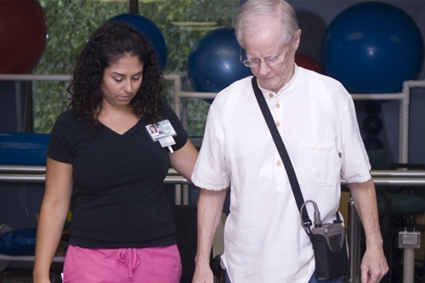 Most people with TBI are able to walk independently within three months of injury. Although most can return to walking, many continue to have problems with moving quickly and with balance needed to return to high-level activities such as running or sports. With hard work, people with TBI can continue to improve their balance for many years after injury but balance problems are still identified more frequently in people with TBI than in people without TBI. Katz DI, et al. Recovery of ambulation after traumatic brain injury. Arch Phys Med Rehabil. 2004; 85(6):865-9. McFayden BJ, et al. Modality-specific, multitask locomotor deficits persist despite good recovery after a traumatic brain injury. Arch Phys Med Rehabil. 2009; 90(9):1596-606. Maskell F, Chiarelli P, Isles R. Dizziness after traumatic brain injury: overview and measurement in the clinical setting. Brain Inj. 2006;20(3):293-305. Patla AE, Shumway-Cook A. Dimensions of mobility: defining the complexity and difficulty associated with community mobility. J Aging Phys Activity. 1999: 7: 7-19. Williams GP, Schache AG. Evaluation of a conceptual framework for retraining high-level mobility following traumatic brain injury: two case reports. J Head Trauma Rehabil. 2010: 25(3): 164-72. Balance Problems after TBI was developed by Michelle Peterson, PT, DPT, NCS, and Brian D. Greenwald, MD, in collaboration with the Model Systems Knowledge Translation Center.